Akimba by Khaeon at My Promo Pool. MPN: 2019202002062. Hurry! Limited time offer. Offer valid only while supplies last. Mezcla (meaning ''mixture'') is one fo the most exciting and influential fusion bands in Cuba, mixing authentic Afro-Cuban rhythms with jazz and rock. 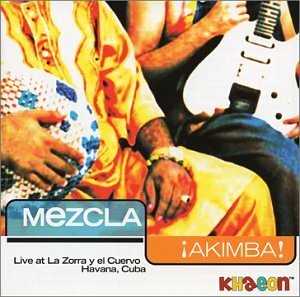 Mezcla (meaning "mixture") is one fo the most exciting and influential fusion bands in Cuba, mixing authentic Afro-Cuban rhythms with jazz and rock. Recorded live at the famous La Zorra y el Cuervo jazz club in Havana in January 2002, "Akimba!" is Mezcla's first "jazz" album since its birth in 1985. One of the group's supporters is the legendary Carlos Santana, the spearhead of Latin rock, who stated in an interview that Mezcla was his favorite band from Cuba. This CD will appeal to fans of Santana, Weather Report, Gonzalo Rubeicaba and Chucho Valdes. If you have any questions about this product by Khaeon, contact us by completing and submitting the form below. If you are looking for a specif part number, please include it with your message.